The notion of world literature, at the very latest introduced with Goethe, has experienced very different interpretations over at least these almost two centuries. Dieter Lamping was one of those who developed their critical position theirto. In addition to numerous other centre lines in the theory of lyrics and classical modernity, particular fundamental issues around the world literature concerned him greatly. 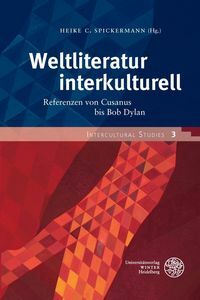 This anthology specifies - in analogy to the categories that were recognized by Dieter Lamping as fundamental for both world literature and comparative literature - in particular intertextual references and transnational relations of literati. Connections to myths - another category of bridging not only national but also epochal borders - and works of art as well as (national) art epochs or works based on topoi find their place as well as attempts to balance or aspire to a hegemony of other places or artists. This is demonstrated by the top-class contributions to Lamping`s sixtieth birthday by Maria Moog-Grünewald, Rüdiger Görner, Rüdiger Zymner, Manfred Schmeling, Bernard Dieterle, Andreas F. Kelletat, Monika Schmitz-Emans, Gabriella Catalano, Marisa Siguan, Heinrich Detering and Manfred Siebald.